Starbucks decides to close down 150 stores, if the economy is doing so well why are they contracting. The housing markets continues to decline, existing homes sales decline as prices and interest rates rise. This is not going to end well. Europe imposes tariffs on the US, China hits back, the strategy, break the globalists trade system. Fed Powell is trying to gain the narrative by telling everyone the economy is doing well, the Fed does not forecast inflation rising like in the 70’s, isn’t this what the Fed told back in 2008. 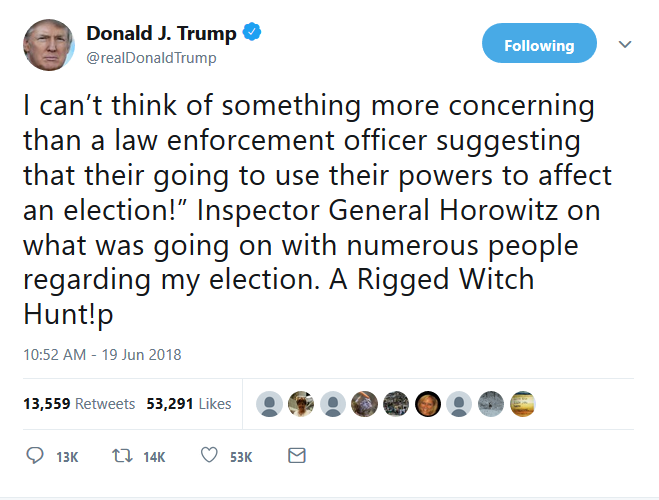 Horowitz drops huge number of bombshells. New commander in Afghanistan says the battle against the IS is working. Senate blocks the sale of the F25 to Turkey. NATO is preparing new drills in Norway to provoke Russia. Iran says the nuclear deal might be over, Europe is not stepping up to the plate. 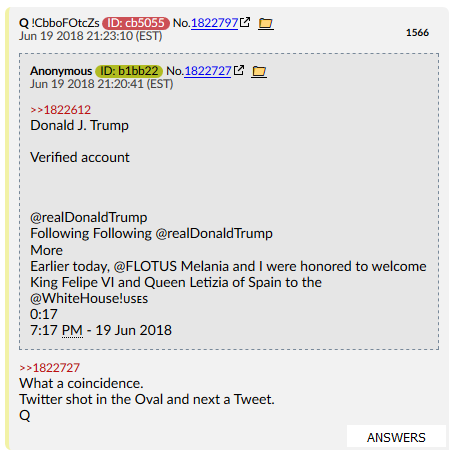 Q drops more bread crumbs, confirms that Q is working with the President. 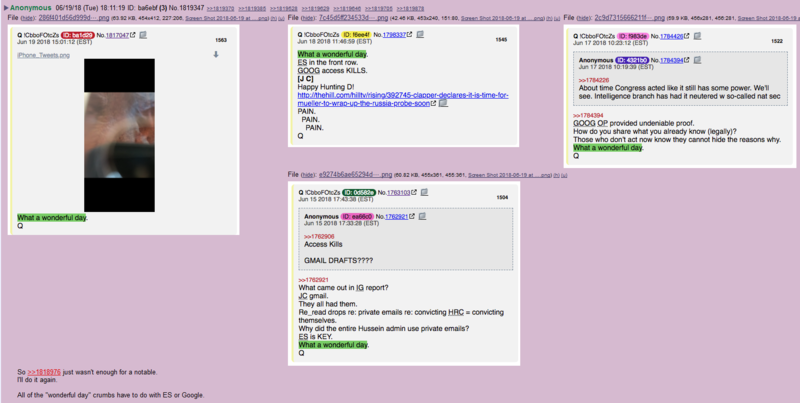 Q then lays out the plan with Iran, explains how the deep state is panicking. The hammer is about to fall, the deep state is trapped, there is now way out. If The U.S. Economy Is Doing So Well, Why Is Starbucks Closing Down 150 Stores? the company released its most disappointing guidance in years, in which it not only announced it would shutter 150 underperforming stores, and slashed Q3 global comp store sales guidance from +3% to barely positive, ot +1%, but it also admitted that the growth phase is now over, “as the company now expects to return approximately $25 billion in cash to shareholders in the form of share buybacks and dividends through FY20” a $10 billion increase from the cash return target announced on November 2, 2017, and confirmation that NFLX can’t even come up $10bn in growth initiatives. This doesn’t seem to fit with the narrative that the U.S. economy is in good shape., I guess everyone is buying their coffee online and waiting 2-3 days to drink it. Following a disappointing April for home sales data, and weakness in May’s building permits data, our fiorst glance at May sales suggests all is not well. Existing home sales slipped 0.4% MoM (and were revised lower in April), well below expectations o a 1.1% rebound. Purchases fell in three of four regions. “Affordability challenges are hurting first-time buyers,” Lawrence Yun, NAR’s chief economist, said at a press briefing accompanying the report. “The housing affordability issue is becoming a crisis,” he said. First-time buyers made up 31 percent of sales, down from 33 percent a year ago. And perhaps explaining why sales are dropping, media home price rose 4.9% YoY to a new record $264,800 (as the inventory of available properties fell 6.1% YoY to 1.85m, the lowest for a May ever). Time to keep hiking rates. The European Union will begin implementing tariffs on €2.8 billion ($3.2 billion) worth of goods imported from the U.S. on Friday, the European Commission said this morning. Agricultural goods and other U.S. products will also be hit with levies. “The rules of international trade, which we have developed over the years hand in hand with our American partners, cannot be violated without a reaction from our side,” Cecilia Malmström, the European Union’s trade commissioner, said in a statement. The US market saw a significant plunge in investment from China in the first five months of the year amid a growing trade row between the world’s two largest economies. Chinese investments totaled $1.8 billion from January through May, representing a 92-percent drop against the same period a year ago. That’s the lowest level in seven years, according to the latest report by Rhodium Group, a research provider that tracks Chinese foreign investment. Chinese corporations that had been pumping cash into the US to cement ties over a long period have cut their investments in recent years. In 2017, investments declined by 36 percent to $29.7 billion from $46.5 billion during the previous year. Trump has persistently slammed Chinese trade practices, calling them unfair. The US president has also accused Chinese companies of stealing American technology and intellectual property. The U.S. economy is not on the verge of repeating the outbreak of inflation last seen in the 1970s, despite the obvious parallel of tight labor markets, said Federal Reserve Chairman Jerome Powell on Wednesday. The labor market is now as strong as it has been in 50 years. In May, the U.S. unemployment rate fell to 3.8% and forecasts say it may break levels not seen since the 1960s. Some Fed officials see similarities. Former Richmond Fed President Jeffrey Lacker, for instance, was fond of warning that there were striking parallels between this economic expansion and the mid-1960s. There are “no signs” that the public has begun to question the Fed’s commitment to low inflation, or that inflation expectations have come under upward pressure, Powell said. FACT CHECK: Do Asylum-Seekers Have To Illegally Enter The US? Attorney Rabia Chaudry said in a tweet Sunday that people must be in the U.S. in order to apply for asylum, and that asylum-seekers on the southern border have to figure out how to get inside. People may apply for asylum at U.S. ports of entry without illegally entering the country. “If you are seeking asylum for your family, there is no reason to break the law and illegally cross between ports of entry,” Nielsen said. Individuals may apply for asylum at a port of entry without illegally entering the country. While the law allows people illegally in the U.S. to apply for asylum, they do not have to “figure out how to get inside” before applying. 80% of minors cared for by HHS arrived in the US alone, unaccompanied, without a parent. They were not separated by the government. The corporate media is reporting Trump is set to concede on his crackdown on immigrant parents separated from children at the border, by signing a “pre-emptive” executive order at any moment, Europe is about to crackdown on the migrant wave unleashed by Angela Merkel (and her various unknown progressive advisors, which some have speculated includes George Soros’ Open Society) in 2015 with Germany’s “Open Door” policy, and on Sunday countries including France, Germany, Italy, Austria and other EU states will meet to try to end a deadlock on migration policy which has brought to a head bitter political divisions in the bloc, and has resulted in Brexit in the UK, a wave of nationalist governments in Central and Eastern Europe, and the first openly populist government in Italy in decades. The official purpose of Sunday’s meeting is to explore how to prevent migrants from moving around the European Union after claiming asylum in one of the Mediterranean states of arrival, although those states now exclude Italy, which following the League/5-Star government has made it clear it will no longer accept immigrants. Denmark and Norway said they were working on creating a centre in Kabul where unaccompanied Afghan minors who have been denied asylum can be sent back, even though the U.N.’s Children’s Fund UNICEF said minors should not be returned to Afghanistan as security had worsened there. Shockingly, there has been no mass media outrage – or even mention – of the Scandinavian countries’ decision. Trump: ‘We’re Not Going to Give Any More Aid’ to Countries That Send Illegal Immigrants to U.S.
“ President Trump told a gathering in Washington on Tuesday. He was speaking about legislation to stop unchecked illegal immigration.But Democrats on Tuesday flatly refused to support legislation, saying it’s unnecessary when President Trump could simply adopt a different “policy.” Trump indicated that he may adopt a new policy — one that denies financial aid to countries that send their people fleeing north. Horowitz is no longer convinced that the FBI was collecting all of Strzok and Page’s texts, even outside the five-month window in which a technical “glitch” (after the 2016 election) prevented archiving. Horowitz is investigating allegations that FBI officials “edited” agents’ 302 forms – which doument an interview with a suspect or a witness. A FD-302 form is used by FBI agents to “report or summarize the interviews that they conduct” and contains information from the notes taken during the interview by the non-primary agent. It consists of information taken from the subject, rather than details about the subject themselves. This is particularly illuminating, as is has been long suspected that fired Deputy FBI Director Andrew McCabe had agents edit or delete the “302” forms created after former National Security Advisor Michael Flynn’s interview. It may also explain why the judge in Flynn’s case ordered Special Counsel Robert Mueller to turn over any “exculpatory evidence” to Flynn’s defense team. Flynn’s legal team did not make this request. Instead, Judge Emmet G. Sullivan issued the order “sua sponte,” or at his discretion, invoking the “Brady Rule” – which requires prosecutors to turn over previously unfiled evidence that might have a material impact on a defendant’s case. Interestingly, two days before the order Mueller filed a motion for an agreed-upon protective order regarding the use of evidence in the case, including “sensitive materials,” provided to Flynn’s lawyers by the office of the Special Counsel. The unmasked agents are Sally Moyer (“Agent 1”) and Kevin Kleinsman (“Agent 5). As reported on Friday, Moyer referred to Clinton as “the President” in a text exchange with another FBI employee four days after interviewing her, according to Thursday’s DOJ Inspector General report. This means that all four FBI case agents working the Hillary Clinton email investigation – the other two being Peter Strzok and Lisa Page – were ardent Clinton supporters, and at least three harbored animus towards Trump. Clinton was interviewed by FBI agents on July 2 about her use of a private, unsecured email server which housed classified information while she was Secretary of State. According to the IG report, however, the FBI had already decided against recommending prosecution unless Clinton lied or confessed. “By the time of Clinton’s interview on July 2, we found that the Midyear agents and prosecutors, along with Comey, had decided that absent a confession or false statements by Clinton, the investigation would be closed without charges,” reads the IG report. Still, Miller insisted that the war was in “the vital interests of national security,” and warned Congress that if the war was ended, ISIS would establish a presence and use the region to plan attacks against the US. US Senators have voted to block the sale of F-35s to Turkey, slamming their NATO ally for plans to buy Russian S-400 missile batteries. Ankara warned of “an alternative” should the deal be called off. The first of the 100 US-made F-35 fighter jets were to be delivered to Turkey on June 21 but now the whole deal might be off as the US Senators voted to kill the sale. The bill, which is yet to be approved by President Donald Trump, passed the Senate floor on Monday, with 85 votes in favor and 10 against. Last week, the Russian Embassy in Norway warned of consequences for the latest U.S. troop buildup, and on Friday, Foreign Ministry spokesperson Maria Zakharova criticized Norway for its expanded military cooperation with Washington. The Russian Embassy of the United States points out on Facebook that “such actions run counter to the decision Norway made in 1949 not to allow foreign states to set up military bases on the country’s territory until Norway was under attack or threat of attack.” This could lead to “rising tensions and trigger an arms race, destabilizing the situation in northern Europe,” the embassy warned, adding that “we consider them to be clearly unfriendly so they cannot go without consequences. Why is this coming out because In the fall, Norway will host one of the largest-ever North Atlantic Treaty Organization (NATO) war drills, involving up to 35,000 participants. Iranian nuclear chief Ali Akbar Salehi warned in comments Tuesday that Iran’s government does not consider European offers sufficient to convince them to remain in the P5+1 nuclear deal. The US withdrew from the deal, and has tried to sabotage the sanctions relief offered by the remaining powers. Iranian officials have said they will only remain in the deal so long as it benefits them. They have sought assurances of access to international trade, including financing of projects by European banks, and the ability to continue selling oil on the international market. 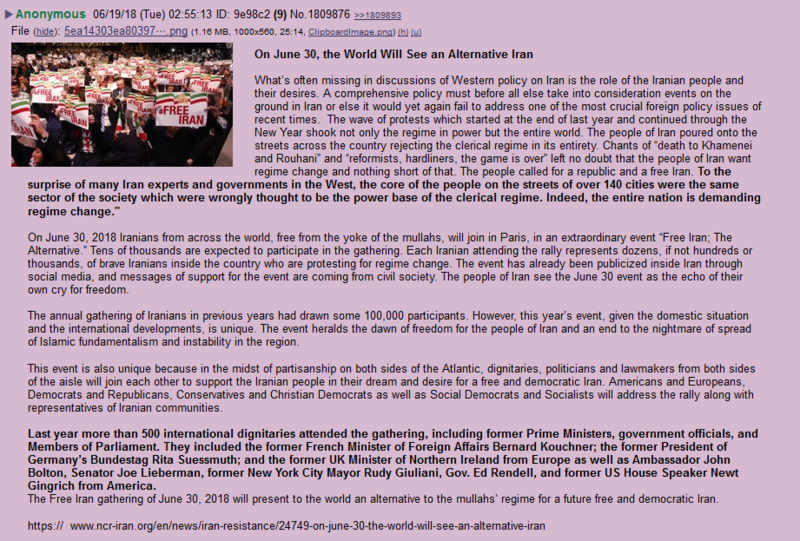 Regime change is coming to Iran. Let’s pray it happens quickly, and as peacefully as possible. As for the Viva Le Resistance message, it was disclosed in the #IGReport. 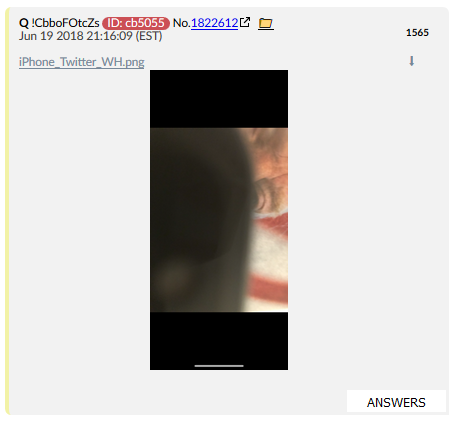 Except, Q is identifying him, here (and last night). So who is J C? No wonder Rosenstein made sure that was redacted! 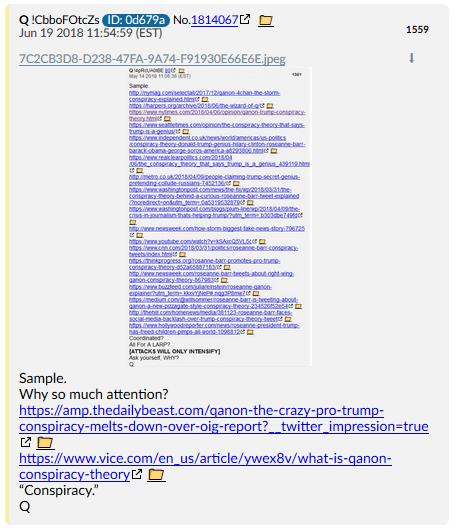 Second Link VICE:A Guide to QAnon, the New King of Right-Wing Conspiracy Theories George Soros, the Illuminati, and Snow White are all controlling the world according to a 4channer who has spawned a legion of supersleuths. You know, for the most part, the mockingbird media wants to avoid talking about #QAnon. Why? Because they don’t want to give it any more attention. However, there comes a point where they can’t ignore it any more, and they have to start spinning up their machinery in order to actively discredit it. We’re at that phase right now, but I think it’s coming a little too late in the game for it to be effective. 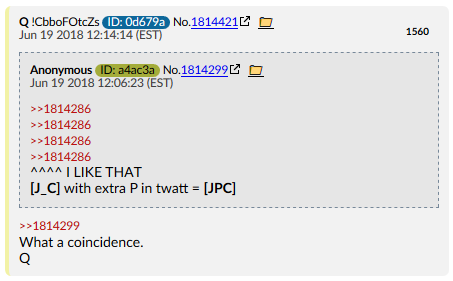 #Anons figured out who [J_C] was referencing by looking at Trump’s tweet this morning, with the extra “p” at the end. Secondly, that’s Texas Democratic Rep. Shirley Jackson Lee. She says in the video that the Republicans are planning on firing Rod Rosenstein this Friday! 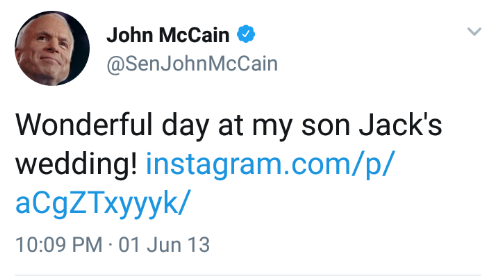 Q hasn’t told us that. 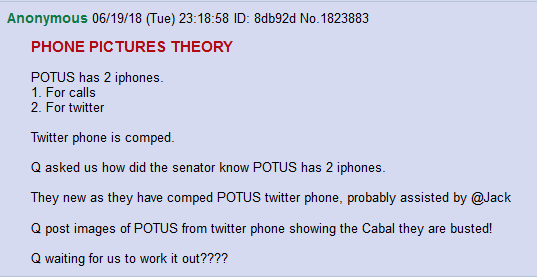 None of the Anons knew that. The ONLY possible way she could have known these spoilers was if it was leaked to her. HOWEVER – big caveat – this might be intentional disinfo. If the good guys are trying to round up and kick out all leakers, someone might have intentionally given bad intel to someone they suspected of being a leaker. Someone who potentially works on one of the subcommittees Rep. Jackon Lee works on, and they, in turn, leaked that bad intel to Rep. Lee, thinking it was true. Trump may have no intention of firing Rod Rosenstein. In fact, given their 2.5 hour meeting at the White House, I very much doubt this is as the case. But the Dems are in absolute panic mode right now, trying to throw up whatever they can to try and stop what’s coming, that they’re getting sloppy and making very public mistakes. Yeah, the more I think about it, the more I believe this was a setup. And she took the bait! 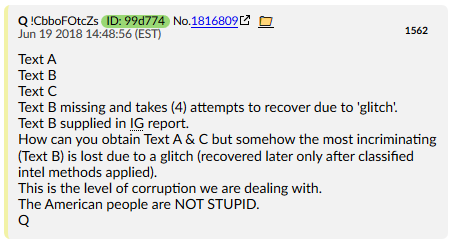 Horowitz explained some of major technical hurdles they had to jump over in trying to recover all these texts, yesterday during the IG Hearing. If I recall correctly, this was about the one text in particular where Strzok says they’ll “stop Trump” – a damning text which proves animus. 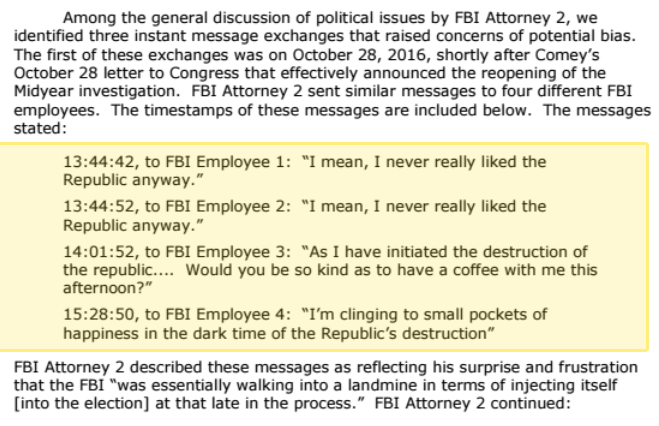 It was very evident that the FBI had made every effort to obfuscate and erase these texts; however, they were able, after contacting a vendor and going through three other processes, to find a database deep within the phone where the missing messages were stored. Evidently, the FBI didn’t even know this database existed – according to Horowitz. Otherwise, it would have been erased as well. It’s bleachbit all over again! Ah, @Jack. Looks like you’re busted! The only thing I’m curious about, then, is the significance of the “What a wonderful day” marker. 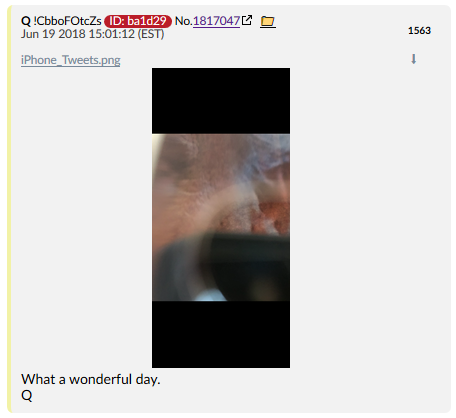 Q has used it 4 times in the past 6 days. 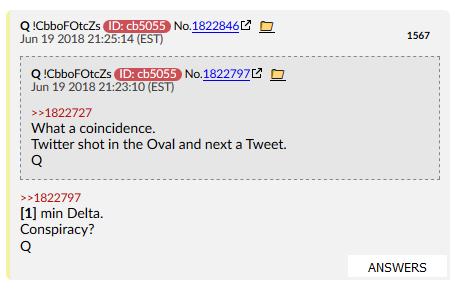 In which case, Q is talking directly to them, mocking them yet again. 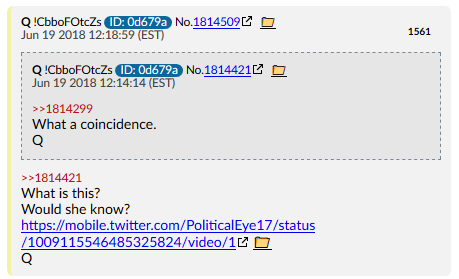 Q is going public. 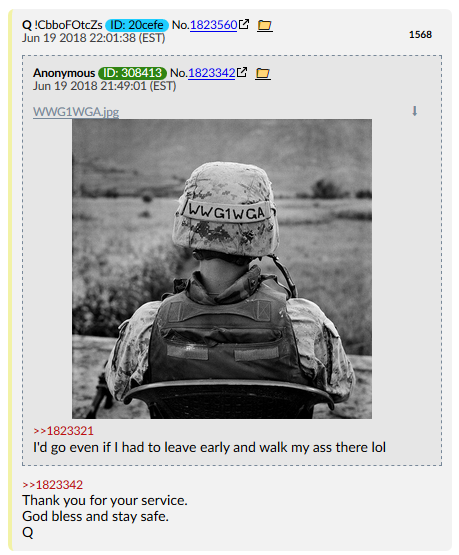 8ch is going to be flooded with normies, awaiting drops, very soon. The media is starting to ramp up it’s “Conspiracy” attacks, and the proofs are there to combat it. I’d keep my eyes peeled for these other proofs, which are already scheduled on the clock. Distract IG report / hearings / Korea. Spelling error due to mobile. Rank & file testifying as informants. Hussein WH SR Staffer ON RECORD. At some point the streets (for them) will not be safe. What are we leading up to?